Or, put another way, your personal preferences don’t matter when it comes to designing for your business*. A combative statement, I know. But it’s the truth. What is the purpose of design? To communicate something effectively. In the case of any design pieces for your business- whether your logo, your website, or your print materials- that means communicating something to your audience in a way that helps move them towards being customers. Good design for your business can help you attract your audience’s attention, speak their language, and draw them in. It’s about visually communicating what your business is and who it’s for in a way that resonates with the people you want to serve. The priority is always on what will work best given your intended audience, not what the business owner likes personally. That’s not to say there’s not some overlap, or that business owners shouldn’t be happy with their logos and other design materials. But it’s a rare case where a business owner exactly fits the qualities of their intended audience. The point is that just because an owner’s favorite color is orange**, doesn’t mean it’s a good fit for the business. The same goes for font preferences, and even layout choices. These are all taken into consideration, but the owner’s preferences are at the bottom of the list. They come into play only when all of the other criteria have been met. Maybe there are just a few slight variations to choose between- two fonts that will work equally well, or two slightly different shades of green. At that, point, yes, absolutely weigh in with your personal preferences. What do you think? 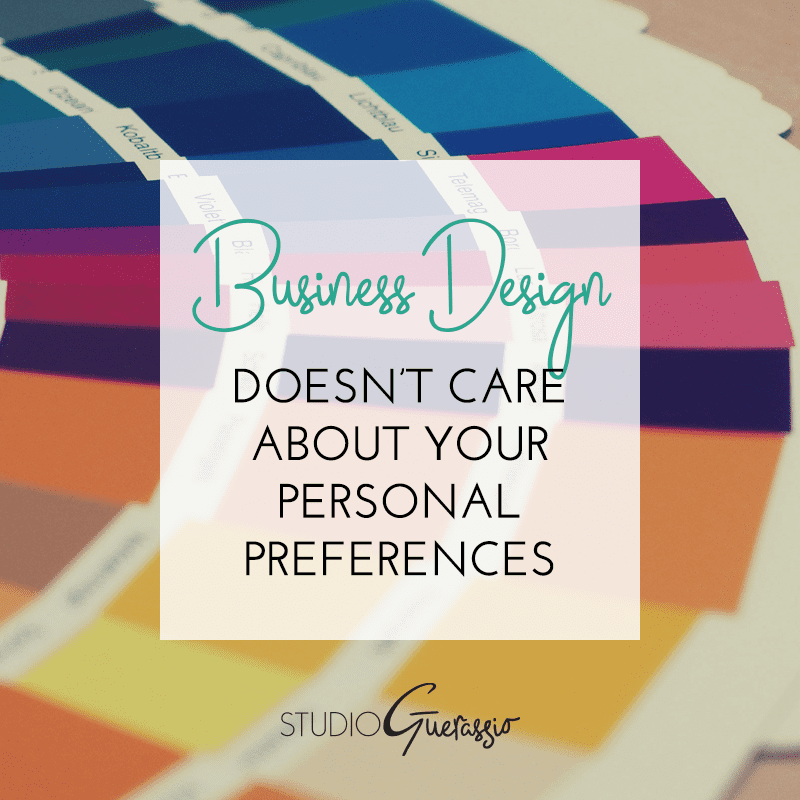 Do you have a hard time setting aside personal preferences in order to do what’s good for your business? *I mean an actual business intended to have customers of some sort and make money, not a personal blog or the like. **My favorite color is a deep aubergine purple. But that wasn’t a good fit for my business! This was such a great post, and is definitely one a lot of small business owners need to read! The point is, the design has to be tailored toward your audience and ideal client. Designing your business for just yourself won’t help you much in the grand scheme of things. Thank you! And yes, there’s so much that goes into design that I think a lot of small business owners aren’t aware of. Lol at the Myspace image! I know exactly what you mean, though. Mine would have purple and dragons. Not exactly ideal for my business! There really is a lot that goes into it! I’ve written a few articles about the subject (with input from my designer friends), but it was great to read about business design from your perspective. Again, this post was great!